Cardiff's bid to be a Euro 2020 host city will hopefully be boosted by hosting the Uefa Super Cup this summer, says Football Association of Wales (FAW) chief executive Jonathan Ford. "It's a bit of a dress rehearsal of what we can put on," Ford said of the 12 August match between the winners of the Champions and Europa Leagues. The FAW will submit Cardiff's 2020 offer before Uefa's Friday's deadline. England, Scotland and the Republic of Ireland are also keen to stage games. The Scottish Football Association will formally launch its campaign for Glasgow to be one of them at a news conference later on Thursday. "We need to make sure we do everything we possibly can to make sure the Super Cup [at Cardiff City Stadium] is a success," added Ford, "and we give ourselves every best opportunity to be chosen as one of those host cities for Euro 2020." For the first time, the European Championship in 2020 will be staged in more than two countries. Organisers Uefa will choose 13 host cities for the 24-team competition. Wales, England, the Republic of Ireland and Scotland were among 32 member countries who told European football's governing body in September that they were interested in hosting games. Uefa - under the leadership of president Michel Platini - will make its decision on 25 September about which 13 cities will be allocated games. Ford expects more than 20 countries to submit bids but Poland, Czech Republic, Finland and Portugal have withdrawn their interest. 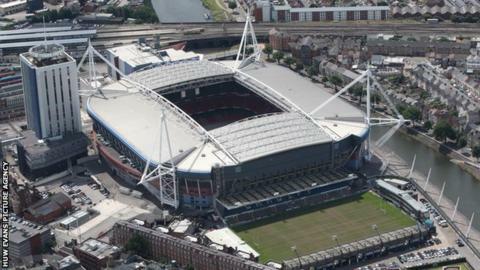 The FAW chief said they had come to agreements with both the UK and Welsh Governments and have worked closely with Cardiff City Council and other bodies to host games at the national Millennium Stadium. "There's a lot of work gone into this," Ford added. "Our bid needs to be compliant with Uefa's requirements from hotels and accommodation infrastructure, travel requirements, you name it. "There's a whole load of stuff that needs to be put together which is of course what we've been doing over the last six months to a year. "Friday is the deadline for bids being submitted and I think you will probably see a bit of a press release coming out from us at that time."